Oracle Database 18c Documentation Library.. Available..!! The new Oracle Database 18c Documentation Library is available.. so.. from now you can enjoy reading about the new features and more.. to access it, click the image or the link down below. Oracle 18c New Feature: “Read Only Oracle Home”.. !! The answer is yes.. the name has simply been changed to reflect the year in which the product is released. Most probable you are so eager to start to read about the new features with the official documentation and more.. so.. read this short and great article of Maria Colgan to get the starting links and more..
Today Oracle officially released Oracle Database 18c on the Oracle Public Cloud and Oracle Engineered Systems. This is the first version of the database to follow the new yearly release model and you can find more details on the release model change in the Oracle Support Document 2285040.1 . Before you freak out about the fact you haven’t even upgraded 12.2, so how on earth are you ever going to get to 18c – Don’t Panic! Oracle Database 18c is in fact “Oracle Database 12c Release 2 12.2.0.2”, the name has simply been changed to reflect the year in which the product is released. More details on what has changed in each of these areas and other improvements can be found in the Oracle Database blog post published by Dominic Giles this morning or in the video below with Penny Avril. 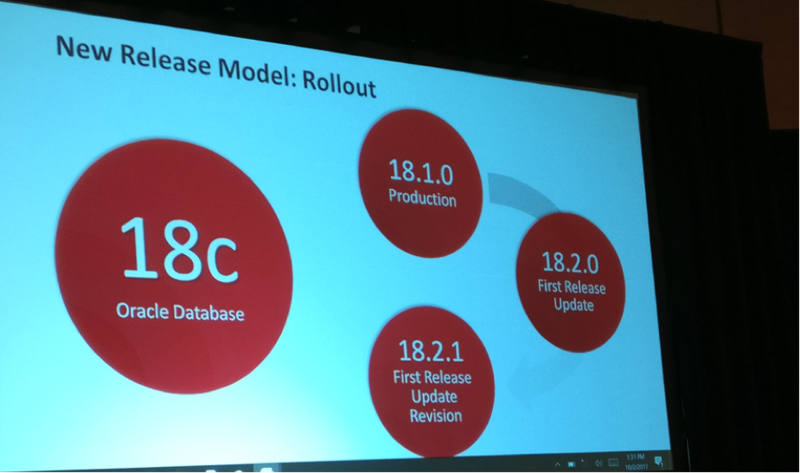 You can also read all about the new features in the 18c documentation and you can try out Oracle Database 18c on LiveSQL. So, when will you be able to get your hands on 18c on-premises for non-engineered systems? It will be some time later this calendar year. You can check the Oracle Support document 742060.1 for more details! Rename a Pluggable database..? How I can do that.. ? It’s with a simple kind of “Rename Pluggable..”.. Uhmm perhaps no.. Do not delay more to get the answer and read an amazing article about it written by the Expert Mike Dietrich.